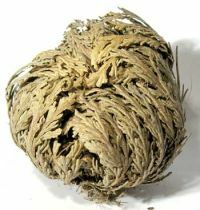 The Rose Of Jericho - The Plant of Resurrection, For Protection and Repels Negativity. A Miracle Before Your Eyes! - The Realm Of White Magic On-line Ordering. Empower your Realm of spiritual well-being with the magic of Incense, Herbs, Powders, Crystals, Spells and much more. Specialists in rare botanicals, incense and magical supplies since 1989. A Miracle Right Before Your Eyes ! Also known as the “Resurrection Plant”, "Dinasoure Plant" and "Jericho Rose", it is said it will return your good deeds when it is propagated with faith and love. 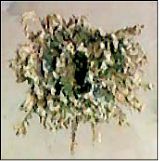 It is said that a house where the "Rose of Jericho" is kept, will be a blessed house! **The Photo shows the Rose of Jericho - BEFORE and AFTER watering! Magickal Properties - Carry on thy person to absorb negative energy! About The Rose Of Jericho - The dry Rose of Jericho should not rot. Place your Rose of Jericho in a bowl with water, after half an hour, it will start spread its branches wide open. You can use cold, warm or even boiling water, which would normally kill any other plant! Water it every day for up to 7 days. Then allow to dehydrate completely (about 2 days), the Jericho will close its branches and curl back into a ball. Then you can re-use it again and again. Many families will carefully keep the plant, passing it from generation to generation. Each plant comes with full instructions including a special Prayer. Choose from three sizes. See ROSE OF JERICHO OIL. More unusual Herbs, Roots and Barks. Magical Herbs that come with a Free Crystal.